Sewing machine needles are the most changeable part of your sewing machine and they influence how your machine forms stitches. Understanding how the parts of a sewing machine needle work will help you choose the correct needle size for the fabric and thread you are using. Knowing about the sizing information on the needle packages will help you purchase the correct size. All sewing machine needles have the same basic parts. The variation in needles is determined by the shape of the parts and the length of the parts. The upper thick part of a sewing machine needle is called the shank. This part of the needle is inserted into the machine. Home sewing machine needles are composed of a flat side and a round side to assist in positioning the needle correctly. Always refer to your sewing machine manual for the correct way to insert the needle into your machine. Industrial machine needles have a completely round shaft, and the groove is used to know which direction to put a new needle into the machine. The shaft of a sewing machine needle is the area from the bottom of the shank to the point. 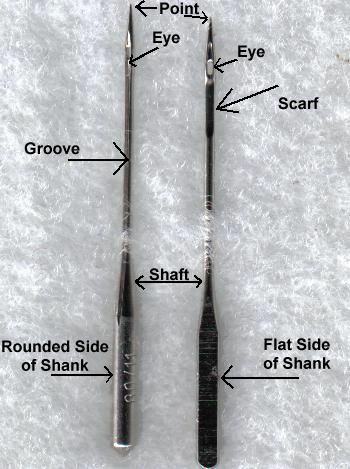 The shaft contains the groove, scarf, eye, and point of the needle. A groove is along the side of the needle leading to the eye and acts as a place for the thread to lay into the needle. Use your fingernail and feel the groove of the needle on various sizes to understand why a different size needle would be needed for a heavier thread. The scarf is a groove out of one side of the needle. The scarf allows the bobbin case hook to intersect with the upper thread and form stitches. The eye of the needle carries the thread so the machine can keep forming stitches. The size of the eye can vary and works in conjunction with the groove of the needle. Using a needle with an eye that is too small or too large can cause your thread to shred and break. The point of the needle is the first contact with the fabric and responsible for how the needle pierces the fabric. The most common types of needle points are sharp, ballpoint, and universal. Sharp needles are for all woven fabric. The sharp point is especially helpful when sewing straight lines and tasks such as tops stitching. Ballpoint needles are designed for knit fabric so that the point glides between the loops of a knit fabric without disturbing the ​fibers of the fabric. Ballpoint needles do not form as straight stitching as sharp needles. The non-straight stitching is more apt to stretch with the fabric. Universal needles can be used with woven or knit fabric. The point of a universal needle is sharp yet also slightly rounded, giving it the characteristics of a sharp and a ballpoint needle. If you are not happy with the stitches your machine is forming, try switching the needle to either a ballpoint or sharp. Understanding the numbers associated with sewing machine needles will help you make the correct choice and possibly solve machine problems. All of the numbers associated with sewing machine needles can stop you in your tracks. It's a simple labeling system, but the confusion comes in because they use both a European and American labeling system. The American system uses 8 to 19, 8 being a fine needle and 19 being a thick heavy needle. European sizes range from 60 to 120, 60 being a fine needle and 120 being a thick heavy needle. Either way, the higher the number, the thicker/heavier the needle. Think of a fine sheer window curtain. You will need a fine needle such as an 8/60 needle. Using a 19/120 would leave holes in the fabric. Now let's look at heavy upholstery fabric. If you were to try and sew through upholstery fabric with an 8/60 needle, it would bend or break. Using a 19/120 provides a needle strong enough to penetrate the fabric and carry a thread strong that's enough for this type of fabric. Now let's look at a combination; you have a lightweight fabric but you want to do a heavy top-stitching detail with heavy thread. Normally, the heavy thread would call for you to use a heavy needle such as a 19/120, but that would leave holes in your fabric. Now you would experiment with a needle that falls somewhere in the middle such as a 12/80. Always test your thread and fabric combination on scraps of fabric rather than the item you are working on. Consider the needle as dangerous as a pair of scissors going into your fabric. You may find a needle size listed as 90/14 or 14/90. The order of the numbers does not affect the size. These needles are the perfect solution for someone who has difficulty threading a needle. Handicap or self-threading needles have an ever-so-slight slit at the side of the needle close to the eye. Sliding the thread against the side of the needle allows it to easily slide into the eye of the needle. Self-threading needles are not available in all types of points and are only available in sizes 80/12 and 90/14. Twin and triple needles open a new world for decorative sewing. Twin and triple needles are attached to a single shank by way of a crossbar. These needles are perfect for evenly spaced rows of stitching. To use these needles, your machine should have the zigzag capability and a throat plate that has a hole wide enough for the needle. You cannot zigzag with the multiple needles in the machine. More than one thread spool holder is required so that each needle has its own thread source. The threads usually follow the original threading pattern, as one thread and then are threaded into each needle. Your sewing machine manual is the best resource for operating your sewing machine with multiple sewing machine needles. The numbers on the packages for these needles is slightly different than regular sewing machine needles. The first number is the space or distance between the needles. The second number is the needle size. Triple needles are also labeled "drilling needles." Skipped stitches on knits can be solved with this needle. A stretch needle is a last-resort needle when ballpoint needles still leave skipped stitches. Many people will not attempt sewing Lycra and swimwear without a stretch needle. The needle sizes available are 11/75 and 90/14. When you're ready to try your hand at heirloom details, this needle is a must have. A wing needle is used for heirloom sewing. The sides of the wing needle shank are flared and create openwork stitching on woven fabrics. The needle sizes available are 16/100 and 19/120. Sewing leather is not challenging when you have a machine and needle that can handle the job. The point of a leather needle is wedge-shaped so that it penetrates leather and other heavy non-woven fabrics. The needle sizes available are 11/75 and 14/90. Denim needles aren't only for sewing denim. These needles have an extra sharp point and stiff shank, making it a strong needle for sewing tough fabrics and through many layers of fabric. The needle sizes available are 10/70 through 18/110. This needle is designed to handle dense machine embroidery stitching. Machine embroidery needles are specifically designed to sew dense embroidery designs without shredding machine embroidery thread, such as rayon and polyester thread.